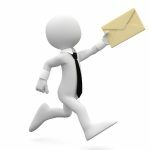 We can provide you with a competitive pattern imprinted concrete quote from a database of authorised paving installation companies around the UK. 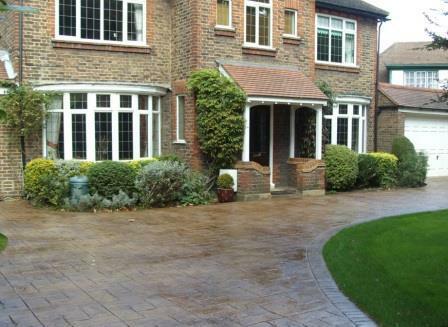 Whether you are looking to renew your driveway, footpath or patio, this service is completely FREE. Pattern Imprinted Concrete is an attempt to copy natural paving products such as stone, cobbles, setts, slate, brick and timber by colouring and shaping concrete. 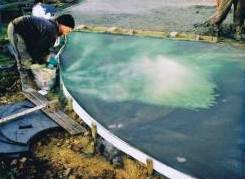 To create the effect, specialised pigments are scattered across the surface of the still damp reinforced concrete and pressed into its surface using printing mats. The printing mats leave an impression in the concrete which resembles the surface of natural stone paving slabs, blocks and setts. Pattern Imprinted Concrete originated from North America where it is also known as stamped concrete, pressed concrete or decorative concrete. In addition to being ideal for domestic driveways, footpaths and patios, it is widely used for pedestrian areas at shopping precincts, theme parks and around fast food restaurants. Pattern imprinted concrete has also been used on film sets, for example to create Victorian cobbled street scenes and the outside dining area on the set of the film Mamma Mia. A typical pattern imprinted concrete quote will include a scale drawing of the paved area to be installed. This should be accompanied by a detailed explanation of how the sub-base will be constructed, the pattern and colours of the concrete and how drainage systems will be installed to deal with surface rain water. Installing pattern imprinted concrete should be left to experts who have the experience to ensure the the finished result is a realistic interpretation of the natural stone paving effect you were seeking. This is because there are so many variables which need to be taken account of, in obtaining what is referred to as a ‘good print’. Achieving good quality pattern imprinted concrete paving requires a solid sub-base, the correct concrete mix, accurate application of colour surface hardener & antique release agent and careful printing of the surface. Should your installer get any one of these aspects wrong, or if there is an unexpected change in the weather, and you will end up with a poor quality paved surface which can only be corrected by digging up the concrete and starting again. Before you decide which pattern imprinted concrete quote to accept, you should make sure that you have seen examples of the workmanship of your chosen contractor. 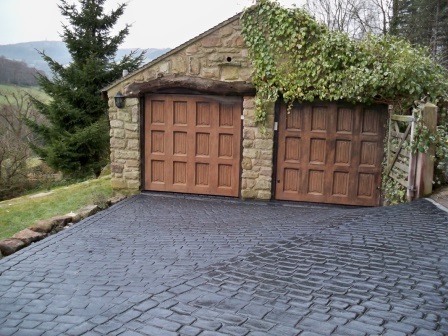 There is a wide choice of patterns and colours available to choose from when considering a pattern imprinted concrete driveway. These include all of the major natural paving products such as stone slabs, granite cobbles and setts, slate, brick and timber boards. And although there are an infinite number of colour variations and mixes to choose from, each type of paving should be reflected in the colour combinations in which it appears naturally. 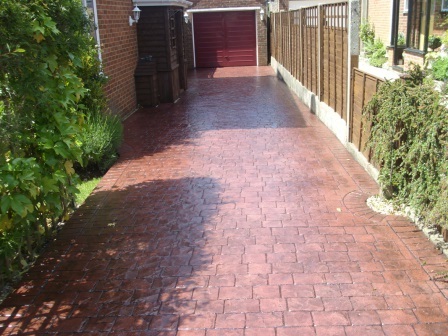 In order to obtain a realistic and natural colour for your pattern imprinted concrete driveway or patio, two coloured pigments are used: Colour Surface Hardener and Antique Release Agent. Colour Surface Hardener is the base colour and is mixed with cement to create a harder and more durable surface to your driveway. Antique Release Agent powder enhances the appearance of the paving by emphasising joints and markings in the printed pattern. 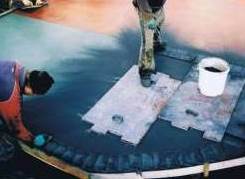 It also helps to prevent the printing mats sticking (by suction) to the surface of the damp concrete which could cause imperfections in the pattern. 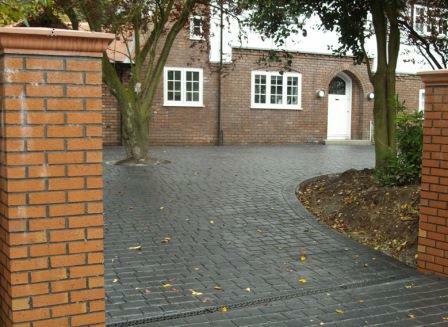 Your pattern imprinted concrete quote should detail exactly which colours are to be used on your new driveway. It should also distinguish between different areas if you choose to have several patterns, features or borders within the overall design. 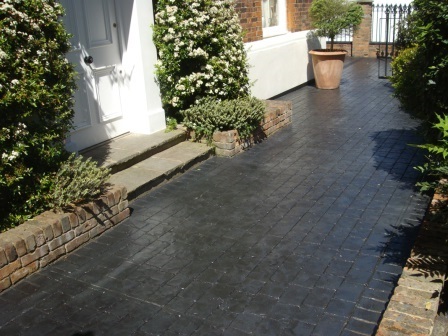 All types of paving for driveways, patios and footpaths have advantages and disadvantages and there are many considerations to take into account when choosing which one is right for you. Cost, durability, attractiveness and practicality are all important but in the end it’s probably down to personal choice and budget. Whichever paving type you decide on, and your pattern imprinted concrete quote won’t be the lowest, you should be aware of its disadvantages and be happy to accept them. It provides the appearance of natural paving products without the high cost. There is a wide choice of patterns, textures and colours available. Being a solid product it does not allow weed growth through. 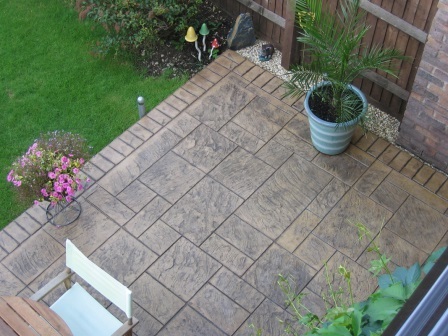 It can be installed more quickly than natural stone paving which means less disruption. It is relatively maintenance free; apart from needing resealing every few years. Damaged areas of pattern imprinted concrete are almost impossible to repair without it being obvious. There are quite a few variables in ensuring a good quality print and even the experts can get it wrong. Concrete has a tendency to crack as it contracts, although crack control joints can reduce the chances of this happening. 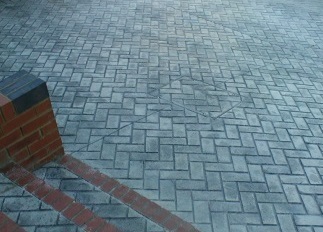 The correct cutting of crack control joints can spoil the overall effect of a natural stone driveway. Because the concrete is a solid slab, underground pipes and cables become inaccessible once it is installed.